Please check the Calendar for screening details. 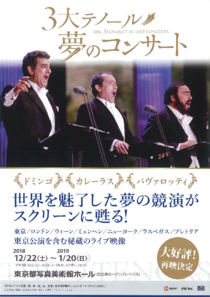 The Three Tenors were a popular operatic singing group during the 1990s and early 2000s, consisting of Plácido Domingo, José Carreras and Luciano Pavarotti. The trio began their collaboration with a performance at the ancient Baths of Caracalla in Rome, Italy on 7 July 1990, the eve of the 1990 FIFA World Cup Final. Zubin Mehta conducted the orchestra. The recording of this debut concert became the best-selling classical album of all time and led to additional performances and live albums. After the success of the concerts in 1990 and 1994 World Cup, The 3 Tenors opened a world tour during the period of 1996-1997. and over 80,000 spectators gathered in each various places around the world, causing a "The 3 tenors" boom all over the world. Pavarotti passed away in 2007, and the activities of the three came to the end, but their achievements are immortal.